"The idea that they would attempt to go to a Mexican drug cartel to solicit murder for hire to kill the Saudi ambassador? I mean, that even – nobody can make that up, right?" "The 2011 plot to assassinate the Saudi Ambassador to the United States shows that some Iranian officials — probably including Supreme Leader Ali Khamenei — have changed their calculus and are now more willing to conduct an attack in the United States in response to real or perceived U.S. actions that threaten the regime. We are also concerned about Iranian plotting against U.S. or allied interests overseas." With Defense Secretary Leon Panetta's recent admission, alongside Israel's similar, near simultaneous, acknowledgement, that Iran is indeed not - I repeat, NOT - building nuclear weapons and has not even made any decision to do so, it seems certain sectors are doing their best to keep those war drums beating and public hysteria over Iran at a fever-pitch. The fact that Clapper - a longtime favored colleague of Robert Gates - would use the bogus Saudi-Mexican-Iranian-Used Car Dealer assassination plot to reach the conclusion that Iranian leaders "have changed their calculus and are now more willing to conduct an attack in the United States in response to real or perceived U.S. actions that threaten the regime" is not only absurd but dangerous. 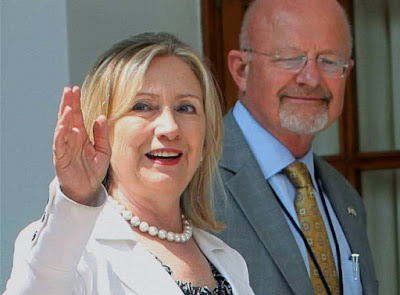 Before this new nonsense travels around the world at lightening speed (as is the purpose of such alarmism), let's all take a second to remember who Jim Clapper is. In 2003, when Clapper was head of the National Imagery and Mapping Agency, he told reporters that "satellite imagery showing a heavy flow of traffic from Iraq into Syria, just before the American invasion in March, led him to believe that illicit weapons material 'unquestionably' had been moved out of Iraq." The New York Times quoted him as saying, "I think people below the Saddam Hussein-and-his-sons level saw what was coming and decided the best thing to do was to destroy and disperse...the obvious conclusion one draws [was that there] may have been people leaving the scene, fleeing Iraq, and unquestionably, I am sure, material." This flat-out falsehood was later resurrected by Karl Rove in his book "Courage and Consequence," and cited Clapper as responsible for the claim. In 2005, The Washington Post's intrepid Dana Priest confirmed that Clapper was lying. "U.S. investigators hunting for weapons of mass destruction in Iraq have found no evidence that such material was moved to Syria for safekeeping before the war, according to a final report of the investigation released yesterday," she wrote. When Obama tapped Clapper to replace Dennis Blair as DNI in mid-2010, even Iraq invasion-booster and illegal surveillance state-champion Dianne Feinstein was wary of such an appointment. As Politico reported, Feinstein, who head the Senate Intelligence Committee, "has questions about Clapper's military background and whether he would be 'beholden to the Pentagon's interests.'" The efforts of the U.S. government to spark hysteria about Iranian aggression are increasingly transparent and consistently embarrassing. Reading the Western press, one would think Iran was assassinating American scientists, flying spy drones over our cities, sabotaging our industrial and military facilities, destroying our economy, racing to put nuclear-armed warships off our coast, and threatening us with a table set with "all options."